Inspired by the latest dental techniques and technology, we are a family-run practice that delivers professional cosmetic and dentistry services to the local community. Our patient-focused ethos will immediately set you at ease, so you can relax and enjoy the care and treatment you receive. 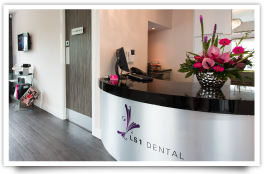 We practice modern dentistry offering everything from regular hygiene and check-ups for all the family, through to teeth whitening, dental veneers and even your own dental makeover. Generally unhappy about the way your teeth look? Are they crooked? Discoloured? Different shapes and sizes? Cracked or chipped? Veneer treatment tailored to your specific needs, could be the answer and the start of a new you. CEREC 3D is a technology that allows us to design, fabricate and fit new crowns, veneers, onlays and inlays in just 2 hours! This streamlines the treatment process and makes us more efficient when caring for our patients. Losing a tooth can really alter your smile and affect your personal confidence. Dental implant treatment has proven to be a highly effective way of creating replacement teeth that look, feel and function just like the real thing!